I have no team spirit. While the other kids were at the big football team, I was smoking behind the gym. But as you know: because I’ve been blogging since 2000, and involved in e-commerce, too, I sometimes get asked to review other people’s websites. So I got asked to review TeamSnap’s online team management software, I almost said no. Then I went over to the site and saw… “cheese rolling” and “yodelling clowns”? I decided to stick around. 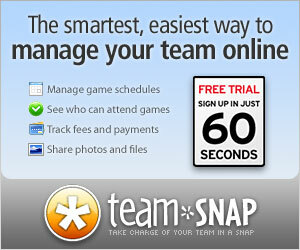 As the site makes very clear on page one, TeamSnap is NOT just about keeping your sports team organized. You can use this site to “manage” any group of people — your family, a church group, clubs. This is a very cool ultimate online team management program, not matter what kind of “team” you’re a part of. I think they’ve thought of everything, including a module to track who’s turn it is to bring refreshments to your next meet. You can see how TeamSnap would be just as good for organizing rehearsals for your high school play, for example. I hesitated to sign up for the “30 Day Free Trial”, because usually this means coughing up your credit card. This is a full feature FREE trial. You get all the same online team management functionality you’d get as a paying member of the Premium Plan (which is normally $9.95/month. There’s also a $6.95/month Basic plan and an ongoing Free plan with fewer features. During sign up, I was asked to choose my sport from a pull down menu. One of the sports is “petanque” (???) Other options include “dragon boat team” and “Australian rules football” and yes, “ringette”. Then this Avatar named Andy pops up to walk you through the set-up process if you want. You can complete the set up by yourself, but like a lot of “wizards”, this is a very helpful function. No matter how corny you or I might think they are, set up “wizards” are a great help to members who’ve spent more time on the football field than in front of a computer screen. And like everything on TeamSnap, the “Andy” wizard is fun. When your account is all set up, you and your teammates/family members can all use the simple, attractive and easy to use online interface to leave each other messages and keep all your info up to date. The section you use to manage your team is very “user friendly”. TeamSnap names categories and stuff the way you and I would, not using trendy MBA or programming jargon. TeamSnap also has a blog (although they need to update that more often) and a Facebook fan page. They are really plugged in. They even have a text messaging option for you and your team mates, in Beta. One beef: the “Learn about Non-Sports Group” link is broken. Otherwise, everything I tried, worked. There’s no excuse for ugly web design in 2009, and TeamSnap is the kind of site you want to use, because it just seems so damn friendly. The design is fresh, bright and inviting, and the playful vibe throughout the web copy (thank God they got that past management!) “humanizes” the site too. It’s easy to see why they were nominated for a Webby Award. If I wasn’t such a crazy loner, I’d actually use TeamSnap for something. But I hope my readers who actually leave the house once in a while will take a look at TeamSnap online team management, because the free trial really is free — no catches. I’m glad I changed my mind and checked it out. The TeamSnap online team management guys just emailed me and said that for a limited time, you can get 10% off if you sign up to use it for a year.